With a stay at Motel 6 Ogden, 21st Street in Ogden, you'll be within a 10-minute drive of Ogden Utah Temple and Ogden Nature Center. This motel is 28.9 mi (46.5 km) from Snowbasin Ski Resort and 2.6 mi (4.2 km) from The Junction. With a stay at WoodSpring Suites Ogden in Ogden, you'll be in the business district, within a 10-minute drive of Ogden Utah Temple and Ogden Nature Center. This hotel is 29.1 mi (46.8 km) from Snowbasin Ski Resort and 2.8 mi (4.4 km) from The Junction. Make yourself at home in one of the 109 air-conditioned rooms featuring refrigerators and LED televisions. 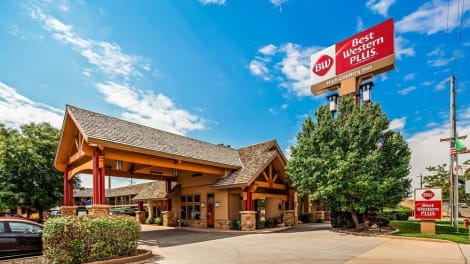 Cable programming and video-game consoles are provided for your entertainment, while complimentary wireless Internet access keeps you connected. Private bathrooms have complimentary toiletries and hair dryers. Conveniences include coffee/tea makers and irons/ironing boards, as well as phones with free local calls. With a stay at Holiday Inn Express & Suites Ogden in Ogden, you'll be near ski lifts, within a 10-minute drive of Ogden Utah Temple and Ogden Nature Center. This hotel is 29 mi (46.6 km) from Snowbasin Ski Resort and 2.7 mi (4.3 km) from The Junction. You can enjoy a meal at The Bistro serving the guests of Courtyard by Marriott Ogden, or stop in at the snack bar/deli. Quench your thirst with your favorite drink at the bar/lounge. Continental breakfasts are available for a fee. Spend the day on the slopes, or enjoy other recreational amenities, which include a fitness center. This Beaux Arts hotel also features complimentary wireless Internet access and a television in a common area. You'll be on the slopes in no time with the ski shuttle (surcharge). Make yourself at home in one of the 120 air-conditioned rooms featuring refrigerators and microwaves. Wired and wireless Internet access is complimentary, while 40-inch LCD televisions with premium TV channels provide entertainment. Conveniences include complimentary weekday newspapers and blackout drapes/curtains, as well as phones with free local calls. lastminute.com has a fantastic range of hotels in Ogden, with everything from cheap hotels to luxurious five star accommodation available. We like to live up to our last minute name so remember you can book any one of our excellent Ogden hotels up until midnight and stay the same night.